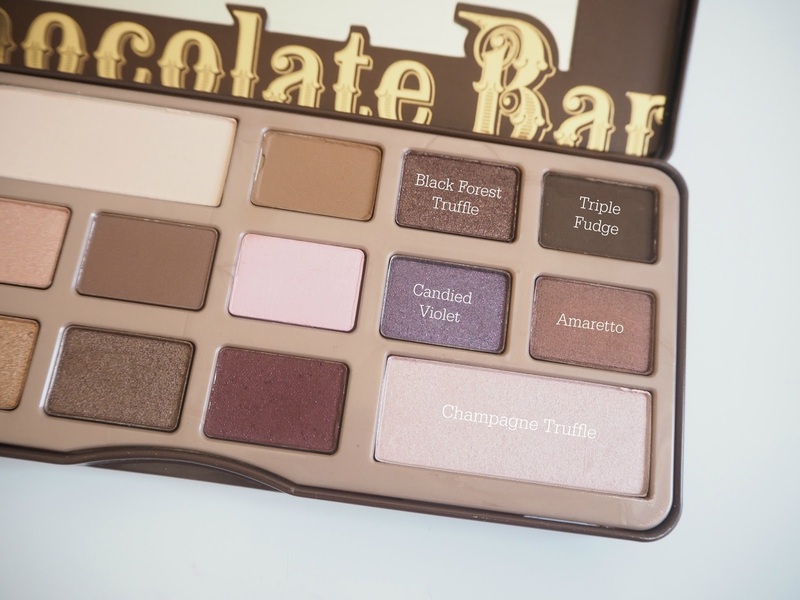 Sometimes you're so late to the party on something that the party happened last year and that's how I feel about the Too Faced Chocolate Bar palette. This isn't even the second version of this palette-no, this is the original that I have owned for maybe two years and only opened up this last couple of weeks. I'm going to admit, when I bought it I thought the outer packaging was vile and the smell of the shadows (chocolate apparently) was overwhelming and nauseating. They were the days when I could smell a whole lot more, but bizarrely post cancer my sense of smell is shot. Now the palette smells of nothing. On the face of it, this is a really great palette that is right up my street. There is a wide selection of shades and finishes-and a good smattering of those 'can't live without' neutral palette tones I go so gaga over. There's also some pink, purple and olive to liven it up. Well no. 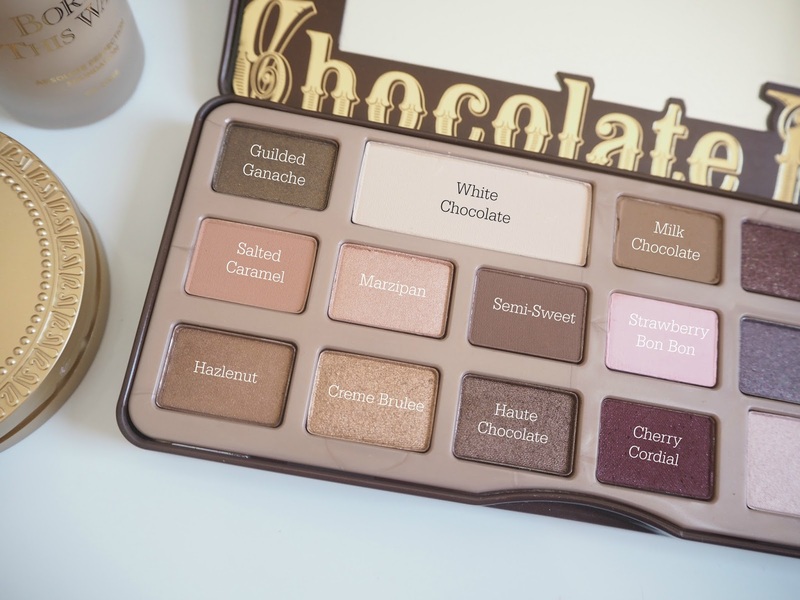 I actually do really like this palette and I think it's a good all rounder but I just haven't felt wowed by it. I'll talk you through the shades, pointing out where I have been underwhelmed. The mattes (White Chocolate, Milk Chocolate, Semi Sweet, Triple Fudge, Strawberry Bon Bon and Salted Caramel) are good. They're really easy to blend and will be a good suite of transition shades for all skintones. I find myself using a combination of milk chocolate and salted caramel in my crease as a bade transition shade. Strawberry Bon Bon is the shade I wouldn't use personally as I would look like a rabbit. The glittery shades (Guilded Ganash, Cherry Cordial and Candied Violet) are disappointing to me. They look glittery in the pan but the glitter doesn't translate to the eye. But it does seem to translate to the cheek. They aren't huge pigmented and do feel a little dry and chalky if I am honest. The shimmery shades are the type of shades I LIVE FOR. 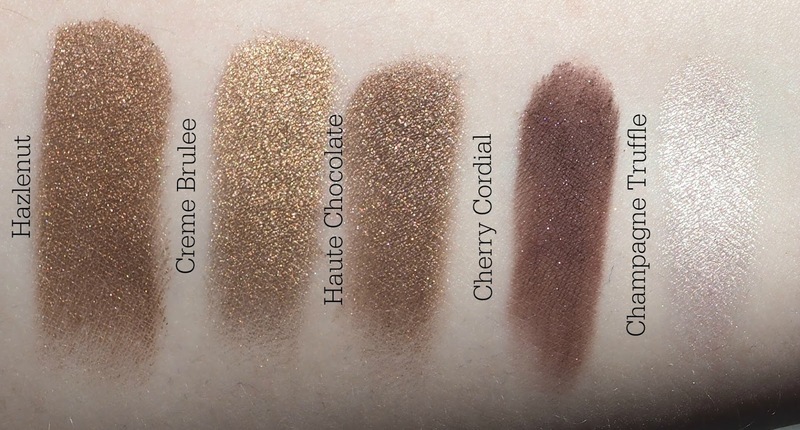 When I swatched these I was seriously swooning and thinking that this was my perfect palette. Marzipan, Amaretto, Hazlenut, Creme Brulee, Haute Chocolate and Champagne Truffle. If the palette was just these shades I would be in a happy bunny. But there is just something a little off about them. They're just ok. I think it's down to the pigmentation, it's just not pow. I wanted Amaretto to be amazing because look at the swatch!! But on the eye it just doesn't translate. It needed to be a little more. A little more pigmented, a little smoother, a little more opaque. And I feel the same about them all really. The biggest let down for me is in the lasting power though. Ok so I do tend to wear my eyeshadow from 7.30am until I take my make up off at in the evening but I find by the time I get home, despite using an eyeshadow primer my natural oils just eat through the colour on my lid. From a distance it's passable and looks like there is something there but up close it's a hot mess.